Steven Defour is still adapting to life in the Premier League according to Clarets boss Sean Dyche. Defour has sat out the last two away games at Stoke City and West Ham as Burnley have moved from the three central midfielders they usually deploy at home to a 4-4-2. 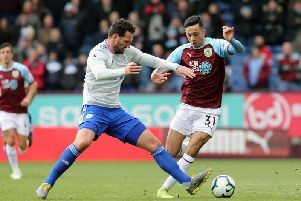 And Dyche pointed to the similar learning curve for Defour's fellow Belgium international, and good friend, Kevin De Bruyne, at Chelsea and Manchester City. Dyche, ahead of tomorrow's trip to Spurs, as Burnley go in search of a first away win of the season: "I’ve spoken to Steven about it. It’s a different journey through the Premier League, it’s physical, it’s fast. "I’ve seen him play at Anderlecht, it’s a different ball game there. It’s slow, it’s methodical, with pockets of good tempo. "It’s a different culture of football there than it is here. The Premier League is still full of quality but it’s hard and fast and the stats prove that. "There’s an adaptation physically and to play with us because we don’t always dominate the ball, but we didn’t in the Championship either and we haven’t done for four years. "It’s adapting to that but when we do have the ball and we need to use it wisely he plays a part in that and it’s finding that right balance to him understanding us and understanding the Premier League." De Bruyne only made three appearances in the Premier League for Chelsea after a £7m move from Genk, but after joining Wolfsburg in 2014 for £18m, he was named Footballer of the Year in Germany, and earned a £55m switch to Manchester City in 2015. He impressed last season, but has since won special praise from Pep Guardiola, who said: "I think he is a special, outstanding player. He makes everything. Without the ball he is the first fighter, and with the ball he is clear – he sees absolutely everything." Dyche added: "Steven is mates with De Bruyne and I say to him all the time, if you look at him last season to this season he’s a different player. "Even a player at that level of market, with those players around him, has still taken time to really become what we’re seeing often from him, which is absolutely top class. "It’s hard for Steven at times because of his age that he’s in and out, but I think it’s an important factor in learning about the Premier League."